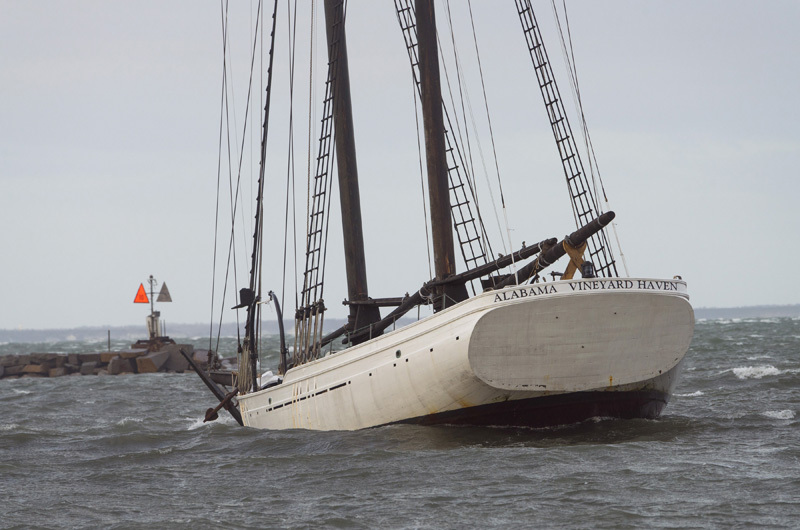 Wind rocks the Alabama in Vineyard Haven harbor. And while science and meteorology are now able to explain wind and its effects, at one time its genesis was cloaked in mystery. Greek mythology suggested that Poseidon, the god of the seas, controlled wind, and that his son Aeolus kept the wind locked up in a cave for safekeeping. Aeolus sent gentle winds through the trees by playing music on the harp, but used a conch shell to create bigger winds that could devastate the land and ocean. According to Homer’s The Odyssey, wind became uncontrollable after it escaped from a bag Aeolus presented to Odysseus to assist with his sea travels. Goddess of the dawn Eos is credited with giving birth to the four winds, Boreas, Zephyr, Notus, and Argestes. And Eurynome was believed to be the goddess who stirred the north wind and the planet into existence by dancing to produce the wind and then mating with it to give birth to the world. No matter the origin, we have not lost our fascination with wind — especially the strongest variety. It engenders it own local nomenclature. Whether you call it a datoo (Gibraltar), etesian (Greece), Frisk vind (Sweden), Williwaw (Straight of Magellan), Chinook (northern Rockies), Monsoon (Asia), foehn, (Alps), mistral (France), zonda (Andeas mountains), or buran (Russia), it continues to be a force that commands our attention and, in the case of islanders, even governs our travel. Suzan is always a delight to read.